Tests and tech are being used to push privatisation into schools. "This is not a problem on our end," said an official from the state of New Jersey, which is paying the education giant $10 million to create and administer the exams. "This is a problem on Pearson's end." It calls on Pearson to dump its high stakes testing business and turn its back on a system which sees schools, teachers and pupils punished on narrow test results, and which is constraining and simplifying what is taught and learnt in schools. Many parents are concerned about the stress children experience from frequent examinations. But it goes beyond that. High stakes testing is rightly viewed as part of a reform package that is seeing education reduced to a narrow set of ‘outcomes’, driven by the commercial interests of large edu-businesses and investors that stand to profit. 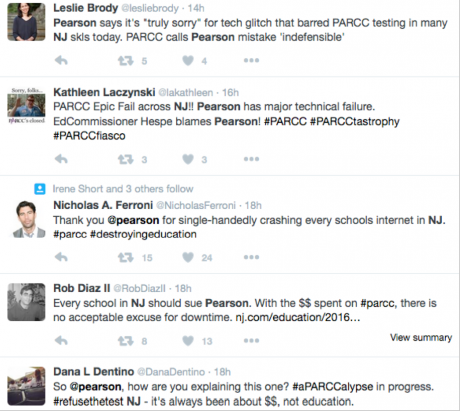 Pearson, as the world’s largest education business, is so far taking the hit for this increasingly technology-driven industry. With education being presented to investors as a ‘$4.5trillion opportunity’*, many more companies – Google, Amazon, Facebook to name a few – have waded in. 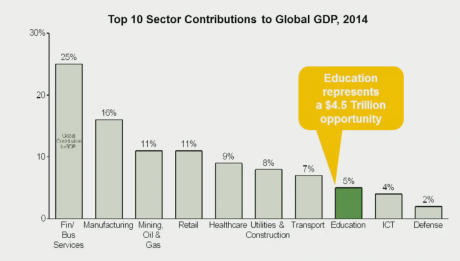 For an investors take on the global opportunity presented by education, see ‘Global Opportunities: Devil in the Details’ presentation by Parthenon-EY (scroll to the bottom) at this week’s GSV ASU Summit. The large video library from the Summit provides a glimpse into the education industry: who’s who; how technology is changing education; and the industry’s strategies for opening up public school systems to for-profit companies.